Arthur Dante Louis Zampella (May 15, 1917 – January 9, 1992) was a prominent physician, public servant and medical educator. He maintained a private medical practice with a concentration in geriatric care in the State of New Jersey from 1947 to 1992. In 1992, West Milford, New Jersey Mayor Tomas Parisi called Zampella “a township father who helped to shape the township of West Milford, New Jersey. 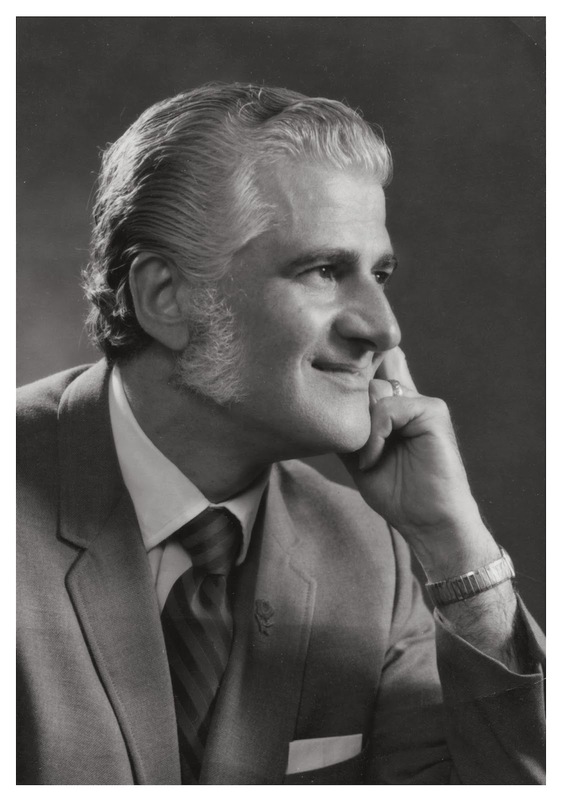 Zampella was the Executive Medical Director of Idylease Nursing & Convalescent Home and Director of Idylease Clinical Laboratory from 1954-1972; both located in Newfoundland, New Jersey. He also served as Medical Director for the National Institute for Rehabilitation Engineering (NIRE) from 1970-1992 and Executive Director of The West Milford Day Center and Medical Director of the Idylease Guidance Center from 1975-1992. 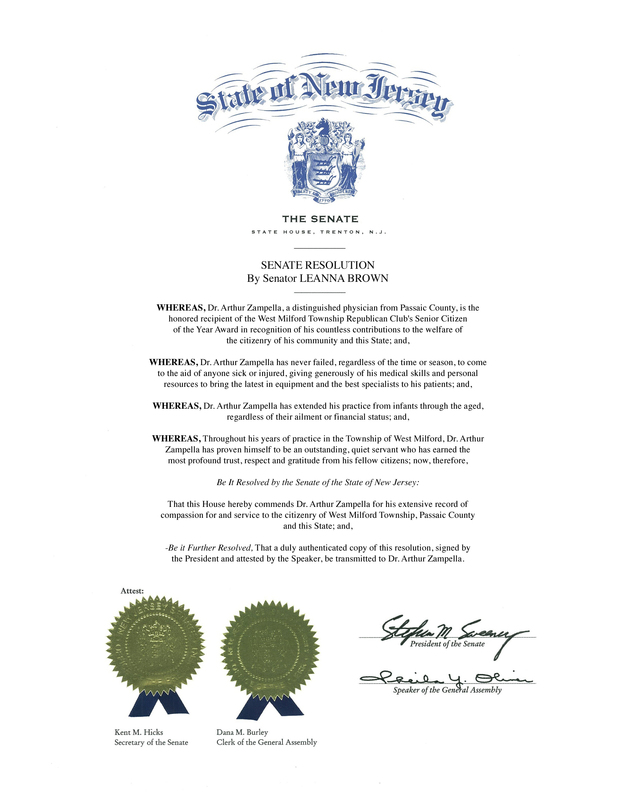 Arthur Dante Louis Zampella was a general practitioner who owned and operated Idylease Nursing Home in the Newfoundland section of West Milford Township, New Jersey from 1954-1992. He was born in Jersey City, New Jersey, to Italian American immigrants Erminio and Filomena Zampella who were from Santomenna in the province of Salerno in the Campania region of south-western Italy. 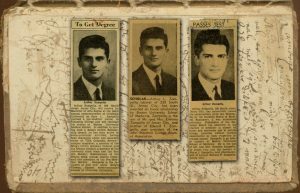 He was one of Five brother that included: Peter Zampella, Nunzi Zampella, Municipal Judge Edward F. Zampella and Alfred E. Zampella. The youngest son Alfred had Public School No. 27 re-named in his honor by the Jersey City Public Schools in 1996. Zampella received his BA degree from Columbia University in New York City in 1938 where he served as Managing Editor of the Columbia Review from 1937-1938. In 1943, he received his M.D. degree from Boston University School of Medicine. He completed post graduate training at Graduate Medical School of New York University with a course study in bacteriology and biochemistry. Zampella served as the Senior Ship surgeon for American President Lines and Port Surgeon for Grace Lines in 1947. In 1949, he attended the former United States Naval Medical School in Bethesda, Maryland, now know as the Walter Reed National Military Medical Center with a course of study in medical radioactive isotopes. Further studies in medicine were completed at the Naval Research Center in Washington, D.C. with a study in nuclear physics completed at the Brookhaven National Laboratory. Zampella served as a Research Analyst with Armstrong Engineering fro 1961-1970 where he studied the factors involved with reducing the vulnerability of humans to radiation in order to maintain aviation preparedness and ancillary studies related to the suppression and reversal of the ageing process. Zampella served as a Project Officer authoring; Naval Implications of Nuclear Warfare and the Biological Effects of Radiation. Zampella maintained hospital affiliations with the Jersey City Medical Center and Christ Hospital (Jersey City, New Jersey); St Clares/Riverside Hospital in Denville, New Jersey; The US Naval Hospital , St Albans in Long Island, NY and Chilton Memorial Hospital in Pompton Plains, New Jersey. He also maintained his private practice at Idylease until his death on January 9, 1992. 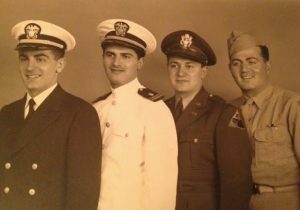 Arthur Zampella enlisted in the United States Navy during World War Two and began his military service as a Naval Interne completing his medical studies at St. Albans Naval Hospital. He was briefly assigned to the Office of Naval Research in Washington, D.C. before being deployed as Medical Officer onboard the USS Samuel Chase which arrived at the 111th, United States Naval Construction Battalion at Calicoan Island, Philippines in 1945. He later traveled on as Medical Officer to U.S. Naval Base Hollandia in Netherlands New Guinea. After the war, Zampella returned to Weill Cornell Medical College from 1949 until 1954 to serve as Project Officer for a study on the biological effects of radiation entitled: Naval Implications of Nuclear Warfare. Zampella was honorably discharged with the rank of Lieutenant Commander. He was Awarded the American Campaign Medal, Asiatic-Pacific Campaign Medal with (2) two stars, The Philippine Liberation Medal with (1) one star and the World War II Victory Medal. Zampella settled in Newfoundland, New Jersey in 1954 and purchased the former Idylease Inn in which he owned and served as Executive Medical Director of Idylease Nursing and Convalescent Home. Zampella served as physician for West Milford Township Public Schools and was police and fire surgeon. He was Board of Health president, director of the West Milford Day Care Center for Senior Citizens, served on the township’s youth and advisory board, was on the Boy Scouts executive board, and was on the West Milford Youth and Family Counseling Board. Zampella belonged to the West Milford Rotary International and served as Crop Walk chair for West Milford and Jefferson Townships. He was named Citizen of the Year in 1990 and also received the West Milford Police Benevolent Association Community Service Award. One of the guiding lights to the founding of the hospital in 1963 was Dr. Arthur Zampella who saw the need to construct a local hospital in the West Milford Township, New Jersey. 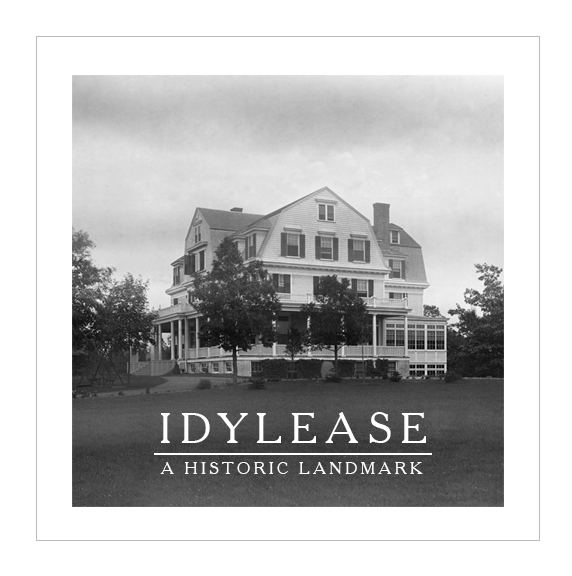 Zampella offered to donate property for a facility next to the former Idylease Inn located on Union Valley Road in Newfoundland, New Jersey. 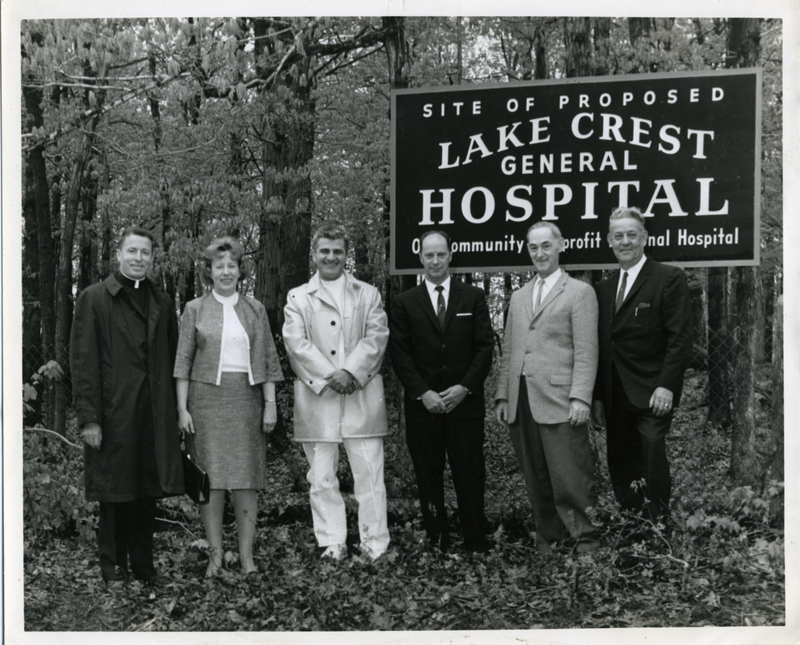 Dedication ceremonies were held on Saturday, May 11, 1963 at the 12-acre site of the proposed hospital. The event was the first public step in the construction of the proposed 100-bed, $2 million hospital. Zampella had earmarked governmental funds that were being applied for to cover one-third of the $2 million cost. The rest of the money was to be raised through private contributors and the towns that were to be serviced by the proposed hospital. Fundraising efforts were also planned in Rockaway Township, New Jersey, Jefferson Township, New Jersey, Butler, New Jersey, Bloomingdale, New Jersey, Ringwood, New Jersey, and Franklin, New Jersey. The hospital was to serve the 60,000 people who lived in the area. The West Milford site was chosen, according to Zampella, because of its centralized location. Some of the other determining factors, he said, were the transportation facilities, terrain and especially weather. 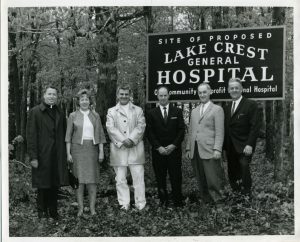 Lakecrest Hospital fate was sealed when Federal Government Funding was cut which ended the possibility of realization of the hospital. Lakecrest board chairman Peter Thornton called the federal fund termination “somewhat catastrophic.” Leonard Dileo, the state head of the federal hospital funding program, said that even with a documented need in the upper Passaic County area for a medical facility, approval by his agency, and incorporation into the state master plan as a priority need, the chances were slim that Lakecrest would get any federal funds. Many dedicated people worked on that project with Dr Arthur Zampella but obstacles kept it from happening. The township today remains without Lakecrest Hospital ever having been built. Zampella suffered from coronary heart disease in mid life and had his first myocardial infarction in 1972. In 1978, Zampella suffered a second myocardial infarction and underwent coronary artery bypass surgery at Newark Beth Israel Medical Center in Newark, New Jersey. He intermittently suffered from varying degrees of angina up until his fatal cardiac arrest in 1992. 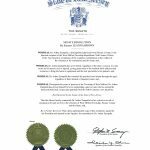 On Jan 9, 1992, Arthur Dante Louis Zampella, M.D. was stricken with a heart attack while caring for the patients in his medical office in the Newfoundland section of the Township of West Milford. Zampella was transported to and died at Mountainside Hospital in Montclair, New Jersey at age 74; the cause of death Cardiac arrest. Zampella was survived by his wife, Alice Christine Seely who died of natural causes in 2013 and by his five children. A service in celebration of Zampella’s life was held at the United Methodist Church of Newfoundland. Burial was at the Newfoundland Cemetery on Route 23. The Rev. Frank Fowler officiated at the service including the Father Mychal Judge who was subsequently killed in the September 11 attacks in New York City. All speakers stressed Zampella’s dedication to help others. Fowler recalled that, “People who were ill and could not afford to pay a doctor were treated by the physician anyway”. ↑ Genader, Ann (2014-01-09). “West Milford Had a Great Loss on This Date in 1992”. North Jersey News. http://www.northjersey.com/community/239374851_West_Milford_had_a_great_loss_on_this_date_in_1992.html. ↑ Staff Writer. “Zampella Named to Columbia Review”. Columbia University Spectator. http://spectatorarchive.library.columbia.edu/cgi-bin/columbia?a=d&d=cs19360512-01.2.4. Retrieved May 12, 1937. ↑ Bryan LaPlaca. “West Milford’s Hospital That Never Was”. NorthJersey.com. http://www.northjersey.com/community/history/back_in_the_day/207150351_Back_in_the_Day__May_12__1963__St__Nowhere__West_Milford_s_hospital_that_never_was_St__Nowhere__West_Milford_s_hospital_that_never_was.html. Retrieved May 13, 2013. ↑ Ann Genader. “West Milford had a great loss on this date in 1992”. Aim Action. http://www.northjersey.com/community/239374851_West_Milford_had_a_great_loss_on_this_date_in_1992.html. Retrieved Jan 9, 2014. ↑ Lois Pemberton. “The Stork Didn’t Bring You”. The Internet Archives. http://archive.org/stream/storkdidntbringy00pembrich/storkdidntbringy00pembrich_djvu.txt. Retrieved ©May 15, 1948 Hermitage Press. Only time to date I enjoyed goin to the doctor. We got to pet the horses which relaxed us and his mild soft-spoken way just all added up to no fear experience of having to go to the doctor. Born in 62 he was the only doctor I ever knew. As an adult dealing with other MD’s I realized how lucky we all were to have him treat us.